A couple of years back, I was sent a lovely hemp/silk blend fabric from Organic Cotton Plus. 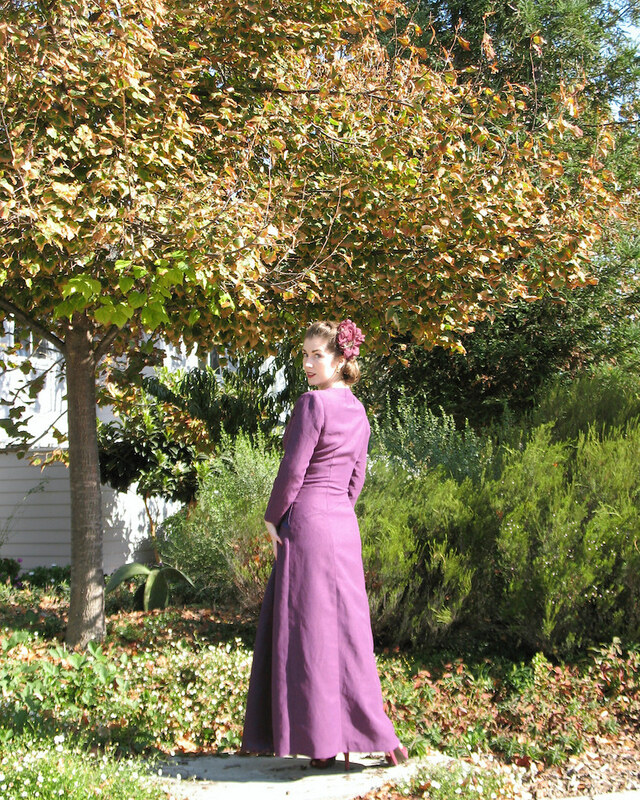 I posted about the muslin and the making of this dress, but I never managed to post final pictures of the piece. Bad, bad blogger. Well, I finally winnowed down the hundreds of photos taken on a day in late October 2017 (for a Marin Symphony performance), and here they are. 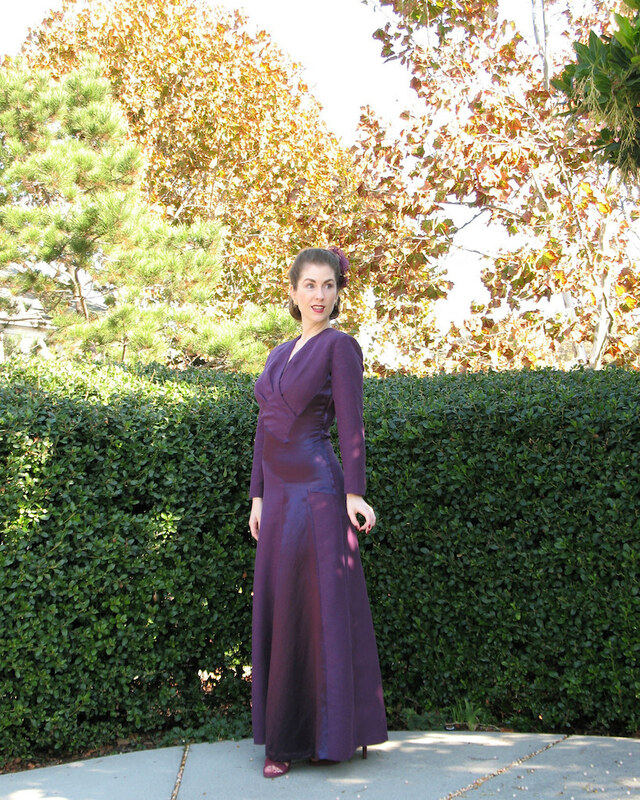 I usually have some idea of how I will style a garment while it is in the process of being put together on the sewing table, or perhaps the inspiration comes from handling the piece for hours at a time. Sometimes outfits require new accessories (or at least, I think they do), but in this case, I had the perfect options on hand. First, I was given these vintage earrings years ago, but the beaded bobbles were coming apart. I was never motivated to fix them until I NEEDED to wear them with this dress. A needle, piece of thread, and a quick pinch with the pliers was all they required! 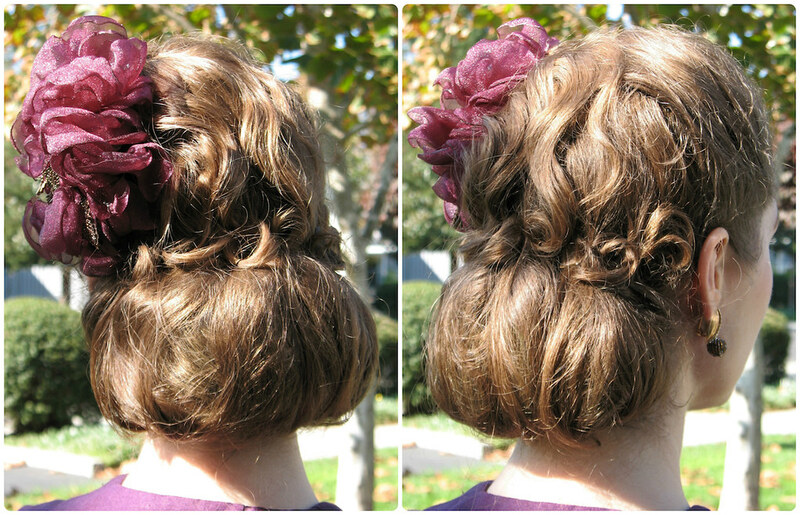 The beaded hair flower was carefully tucked away in a box. I sometimes lament the fact that I can't get away from my preferred color palette, but in these instances, it comes in handy. 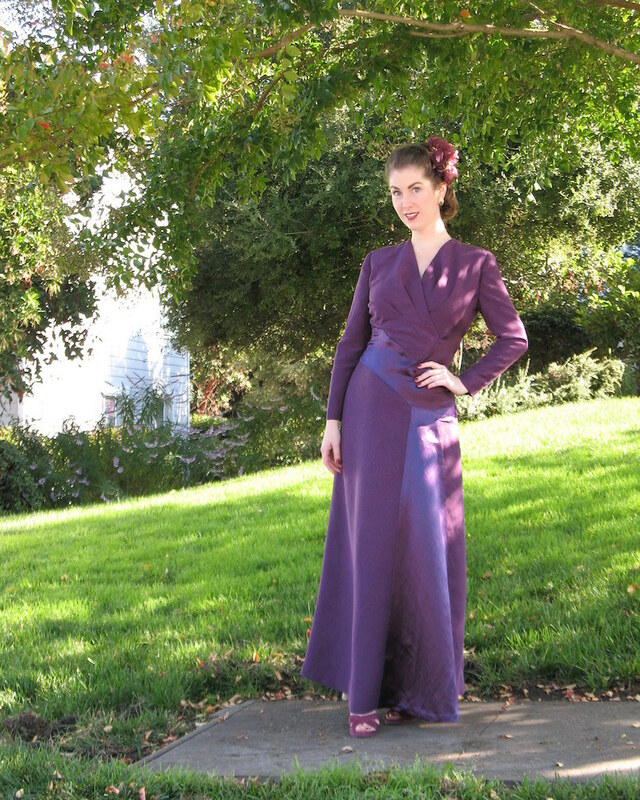 Back in 2010, I made another 1940s gown from a purple toned fabric and, of course, required a bit of flair for my hair. Some poly organza, a lighter, a hair clip, and an antique beaded motif with some issues was all I needed. And with that, the accessories for my new gown were taken care of. I do love that 1940s dress design is full of sleeved evening garments which I find so much more interesting than yet another strapless gown. I picked this particular Vintage Vogue design because of the fact that I wanted to use both sides of my hemp and silk fabric. 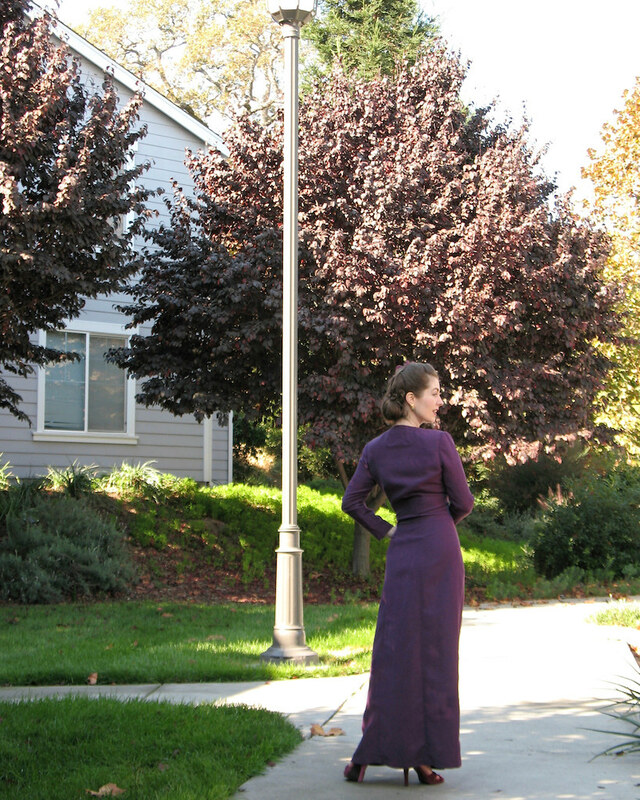 The front skirt inset felt like the perfect way to accomplish this. 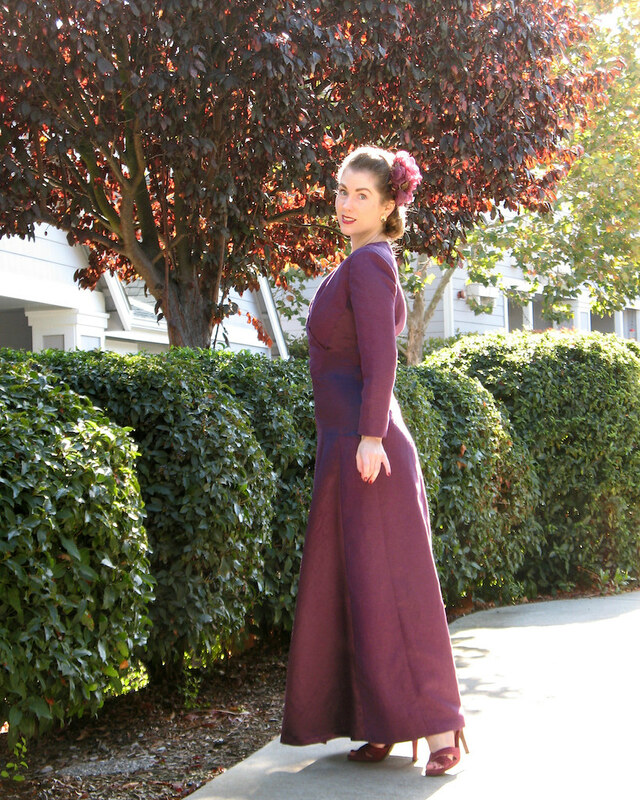 And I am sure that I had something more insightful to say about this project back when it was fresh in my mind, but I am just going to leave this post here with the note to myself that I am quite pleased with how this dress turned out! Throwin' an old bone (and I can hear you cackling, cackling I say! ), but I'm still here, a-waitin' on the postin' with the snood. Recalling the spread on this pattern (in a soft salmon), the model was tarted up by someone with a heavy hand. You look, as always, understated and elegant, and the colorway you chose (great flip-flop of the same fabric!) is very, "We stayed for a smart cocktail." Your "repair-and-it's-there skills" are laudatory. 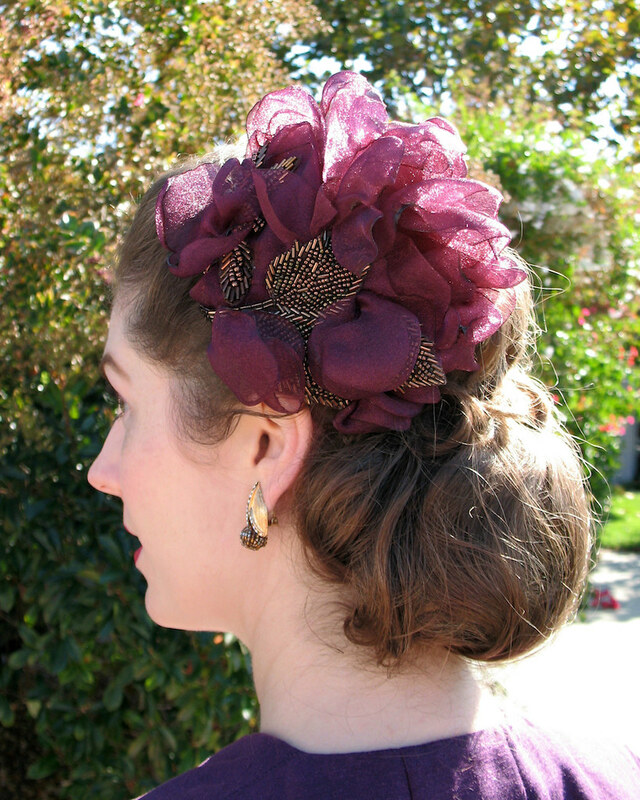 How many hats you've created, earrings you've re-purposed or fixed, and embellishments you've come up with, is amazing - and they always finish your "look" off with a, "This is how I envisioned it." confidence. Surely you can share some of the unsolicited comments you received (we love when you "dish"). Such an elegant look. Love how you used the back side of the fabric for contrast. Brilliant! And your hair flower is perfect with it. So beautiful! I impulse bought a bright blue silk/hemp woven and am now struggling to think of what to do with it (it's a bit too shiny to use the right side for a whole garment). Your garment is lovely and is making me see the fabric (and the wrong side) in a new light! I also have a set of vintage Italian patterns that rely on something similar to the Haslam system you posted. Maybe it's time to take the plunge?? 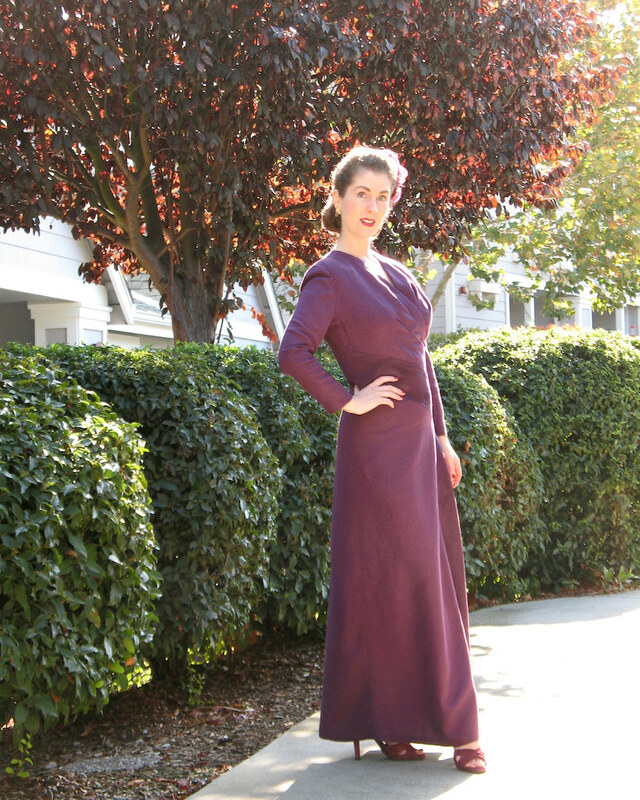 Yet another AMAZING garment, you do such beautiful work! I agree about the older styles having sleeves & interesting design lines. As you say, do we really need another strapless gown!! Just lovely! And may I ask how you did your hair? That is, I have no idea how that style is created but I love it. Any hints would be great.